Why is Paradise Reef in Cozumel a true paradise on earth? Located in the western part of Cozumel, Paradise Reef is one of the most visited spots for snorkeling tours and scuba diving on this island. Of course, Cozumel Island has some breathtaking snorkeling points, but each of them has unique qualities. It doesn’t matter whether you are a seasoned, professional snorkeler or an individual who wants to learn how to conduct snorkeling activities, Paradise Reef may be the best place for you. What makes Paradise Reef so popular in Cozumel? 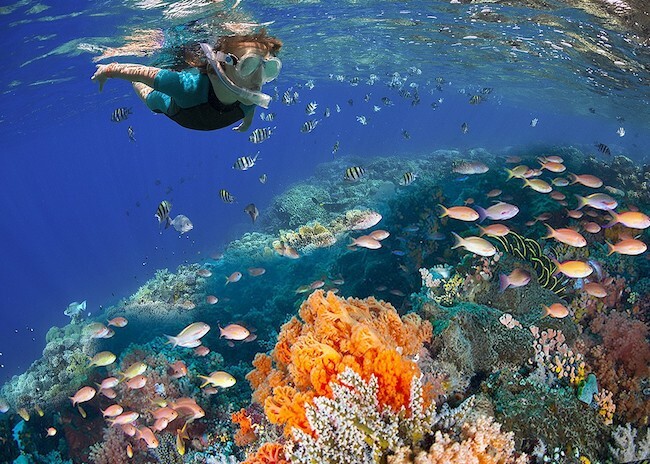 Paradise Reef consists of two separate snorkeling coral reefs – north and south reef. Depending on the level of experience and your skills, you can choose to snorkel or dive in different parts of this area. What is important to remember is that the entire area blesses with amazing nature and there are some stunning marine life forms found here. The reef pack with sea fans, brain corals, star corals, gorgonians, and sponges. If you are planning on using your GoPro camera while you are on this snorkeling tour, you can rest assured that you will take some fantastic photos and videos. It’s also worth mentioning that this is the area where you will probably see the famous, endemic Cozumel Splendid toadfish. Where is the Paradise Reef located? As we already said, Paradise Reef (or Paraiso Reef as locals call it) is in the western part of the island. It’s situated very close to the largest city in Cozumel – San Miguel, which is about 10 minutes drive from the reef. Paradise Reef is part of the system of reefs that are used by many snorkelers and divers in Cozumel. Some other famous beaches located in this area are Villa Blanca which is north of Paradise Reef, as well as Tormentos and Yucab Reef. Why is Cozumel’s Paradise Reef the best for snorkeling? It seems that there is more than one good reason why this reef is famous among Cozumel travelers and cruisers. First of all, this is a relatively shallow reef. As we have mentioned before, this reef has two separate areas where snorkelers can enjoy in their snorkeling activities. Generally speaking, this is a shallow reef which is perfect for novice snorkelers. The depth is between 20 and 50 feet. The more superficial part is in the north. Those who are more experienced can try the deeper waters in Paradise South close to the International Pier. But, the versatility of Paradise Reef is not the only thing that makes this place unique. The other one is the fact that you can enjoy a wide array of animals and plants that naturally occur in this place. From endemic species to well-known marine animals, you will enjoy lush nature in Paradise Reef. Feeding the fish under the guidance of an instructor is possible. These are some of the reasons why Paradise Reef is the best cozumel snorkeling destination and why you should visit this place at least once while you are here.